I overheard some parents talking about these muffins earlier in the week and I was intrigued. Mrs Duff runs the after school cookery club and by some strange coincidence I bumped into her on Friday afternoon as she was gathering her charges. I plucked up the courage to ask for the recipe and in true Mrs Duff fashion, Ruthie, Lucia and I were swept up with the rest of the gang en route to the cookery room. Within minutes I was holding that precious recipe in my hand. These little muffins are winners. They really do look and taste like doughnuts and best of all, this is a kid's recipe, so those little munchkins can mix up a batch in no time. Preheat oven to 200 C. Line a 12 hole muffin tin with paper cases. Combine the flour, ground almonds, baking powder, xanthan gum and sugar in a medium sized bowl. In a separate bowl combine the milk, melted butter, eggs and vanilla extract. Gently stir the wet ingredients into the dry ingredients until just combined. Do not over mix. Spoon a tablespoon of mixture into each muffin case. Add a dollop of jam into the centre of each and then cover with another spoonful of mixture. Bake for about 20 minutes until well risen, golden brown and firm to the touch. Meanwhile prepare the topping. Melt the butter. Place the sugar in a wide shallow bowl. When the muffins are baked leave them to sit for about 5 minutes. Brush the tops with a little melted butter and then dip in the sugar. Transfer to a wire rack to cool. Serve warm. My mind is buzzing with the number of variations you could try as fillings for these. I would try substituting the jam with a home made lemon curd or with a dollop of creme patisserie for the ultimate jam doughnut muffin. 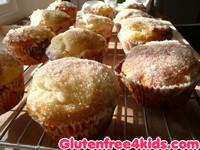 For breadmaking I also use plain gluten free flour (Doves Farm) for the same reason. Doves Breadmaking Flour has raising agents and xanthan gum built in. Once again the amount "built in" may not be what's required for a particular recipe- so being able to adjust this is important. I often get asked why I don't reccomend using any of the perscription mixes/flours in my recipes. Many of these flours contain codex wheat starch, which I won't use. They also contain other additives including a fair amount of salt. These flours will behave very differently from ordinary gf flour so it is not advisable to substitute one for the other. Doves Farm Plain Gluten Free Flour is available from most supermarkets and is usually in the free from section. You can also purchase Doves Farm Xanthan Gum from most large supermarkets. Xanthan Gum is also available on prescription. Our family is trying gluten free diet and this is such a treat!!! And so easy to make.. My husband was missing dougnuts (his favorite treat) and this is 100 times better than the normal ones you buy in a shop to say the least. I have doubled the recipe and cook them in a bigger silicone muffin pan and they come out like proper jam doughnut size and shape. I just wanted to thank you so much for sharing this. And somehow I feel as if this is healthier as it has almond in it!! BIG HUGE DOUGHNUT HUG your way. Am loving your recipes but we have to have nut-free as well as gluten-free in our house. Can I just substitute more flour instead of the ground almonds in your recipes do you think ? Hi Lisah, thanks for your comments and I appreciate that there are many out there who need to be nut free. Unfortunately it's not as simple as adding more flour as this will give you a much denser muffin or cake. The almonds add moisture to baked goods and help cakes and muffins to be lighter in texture. You could add a little more flour say a couple of tablespoons and possibly an extra egg or part of an egg to help improve the texture. The proten in eggs give cakes a more tender crumb and also help in the rising giving a lighter texture. It will have to be a case of experimenting a bit to see if these changes in the recipe give you a good result. Please let me know what discoveries you make along the way.